Welcome to the opening at Babel Art Space on Friday 14th of October at 7 p.m. 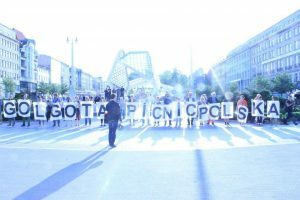 There are many lines to be drawn between hungarian artist Árpád Forgó and norwegian artist Edith Lundebrekke. 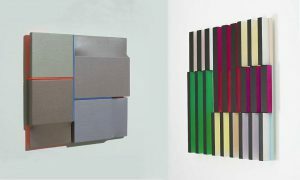 Perhaps the strongest connection is a display a confident experimentation with space, geometrical shapes and colour that situates them within a firm abstract tradition. Both Forgó and Lundebrekke aim to challenge our physiological experience of these visual elements and how we perceive them. The exhibition Colour Kitchen presents several new works separately produced by the two artist but in the context of each others company. There will be a short artist talk at the opening. 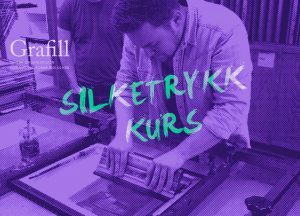 The course will give you an introduction to 2-layer screen printing, including transferring your image to a prepared screen using ultra violet lights and hand printing the image. The maximum amount of participants is 6, and registration can be done by sending an e-mail to: mail@lkv.no. Registration is binding. The price for the whole course is 950,- If this course is filled up quickly we will try and arrange an extra. Participants will be divided into to groups with the first starting at 10:00 and the second att 11:00. The first group will finish at 16:00 and the second at 20:00. Participants need to bring the following: The image they want to print on a transparent sheet and their own paper to print on. The print paper has to be A3-size, and the transparent paper with the image you would like to print should be A4. 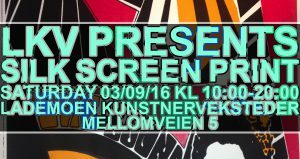 We are very happy to announce the list of artists accepted for the 2017 residency at Lademoen Kunstnerverksteder. Looking forward! DIY nettside for kunstnere: kursholder Daniel Hansen går i gjennom web-baserte løsninger for nettside, med fokus på effektiv og god presentasjon av ditt arbeid og enkle løsninger for å oppdatere nettsiden din selv. Det blir også en gjennomgang av hvordan domenenavn fungerer og hvordan du kjøper og bruker dem. Alle deltagere må ha med egen laptop. Ta også med digitale bilder, nettlinker til video eller annet material som du ønsker å bruke på nettsiden. Max 12 deltagere. Meld deg på til mail@lkv.no. Påmelding er bindende. LKVs kurser er åpne for alle medlemmer av NBK, NKM og kunststudenter. Current guest artists at LKV Klaus Fröhlich and Forgó Árpád will hold an artist talk each, presenting their current work and projects through two 20 min talks. Forgó Árpád is a hungarian artist working in an abstract tradition, using basic geometric methods such as reflection, shifting and rotation. He opens an exhibition at Babel Art Space together with Edith Lundebrekke on October 14. Klaus Fröhlich is a german photographer based in Essen. He opens an exhibition at Babel Art Space together with norwegian poet and artist Arild Vange on the September 16. 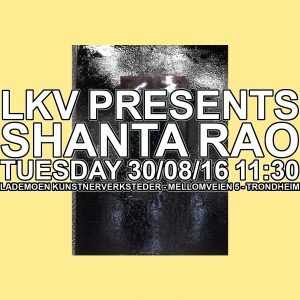 Current guest artist at LKV and exhibitor at Babel, Indian-French artist Shanta Rao, is giving an artist talk at LKV. Her exhibition at Babel is open until August 28. There will hopefully be soup served after the talk, welcome! The maximum amount of participants is 7, and registration can be done by sending an e-mail to: mail@lkv.no. Registration is binding. The price for the whole course is 650,- If this course is filled up quickly we will try and arrange more. Grafill Trøndelag holder kurs i Silketrykk på LKV i Mellomveien 5. Grafill Trøndelag jobber frivillig for å tilby sine medlemmer faglige og inspirerende aktiviteter gjennom året. Prisen på silketrykk kurset er derfor holdt så lavt som mulig og drives non-profit. Som Grafillmedlem blir du sponset av Grafill og kan få delta på kurset til halvpris da Grafill Trøndelag dekker resten av kostnadene. Having spent 6 weeks at LKV as an artist in residence, Kadie Salmon will hold an Open Studio day on the 16th of June. Drawing on the city of Trondheim for inspiration, Kadie has spent 6 weeks continuing her ongoing exploration of historic notions of romanticism in relation to landscape, folklore and history. By extracting and re-constructing these notions in a contemporary context, her new body of work seeks to further question the fine line between romanticism and that of idealism, desire and personal fantasy. During the Open studio, Kadie will be displaying and talking through a body of new drawings created during her time on the LKV residency programme, whilst also showing her series of multiple exposure photographic works taken at midnight across various sites in Trondheim. On her return to London Kadie will continue to develop this series as large format, hand coloured photographs. This new body of work will later be exhibited as part of her solo show at Babel Art Space, Trondheim in 2017. Wojtek Ziemilski is a polish theatre director and visual artist. He creates multi-disciplinary works using a variety of forms and media taken from the performing and visual arts. During June Ziemilski has been a guest artist at Lademoen Kunstnerverksteder, working on his project “Gestuno” – a series of short videos exploring the relation between language, culture and heritage, which takes as it’s basis the Norwegian Sign Language. 12:00, tomorrow 15/6 Soup will be served for a low price. Welcome!